Burp Suite is an integrated platform for attacking web applications. It contains all of the Burp tools with numerous interfaces between them designed to facilitate and speed up the process of attacking an application. All tools share the same robust framework for handling HTTP requests, persistence, authentication, downstream proxies, logging, alerting and extensibility. 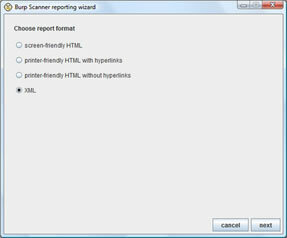 Burp Scanner now allows reporting of issues in XML format, to enable easy integration with other tools.